Today is day three of the Bridgestone World Solar Challenge, the biannual trans-Australia race for solar-powered cars. Normally, the race is full of very interesting cars that look like solar coffee tables and have zero chance of being viable in the real world. Thanks to a new class of car in the race, however, that's all changed. The new class is called the Cruiser Class, and unlike the Challenger or Adventurer classes, these solar cars must have at least a chance of being viable, general-use cars. Where the traditional solar racecar has basically been the most aerodynamic, lightest possible way to transport one skinny college-age driver and a solar panel, the Challenger class cars have to be "able to meet the requirements for road registration in the country of origin." With entrants scored according to their energy consumption and the subjective element of practicality, this is the first time subjective determinant of success will feature in one of the main classes. The judging concept exposes designers to the ‘real-world’ needs of industry to predict what end users (in this case our panel) find practical, attractive or present that essential point of difference from other contenders. Whether this be a new invention or innovative application of existing technology, we look forward to seeing some interesting outcomes. This is a pretty big shift for solar car racing, where most of the cars have been ultralight three-wheeled science experiments. The cars have always been extremely impressive, but their inherent fragility and extreme specialization have always suggested that solar power for cars would remain a laboratory curiosity. It's great to see that's no longer the case. The Cruisers have to seat two people side by side, and must have four wheels. In short, they need to resemble a conventional car as much as possible. 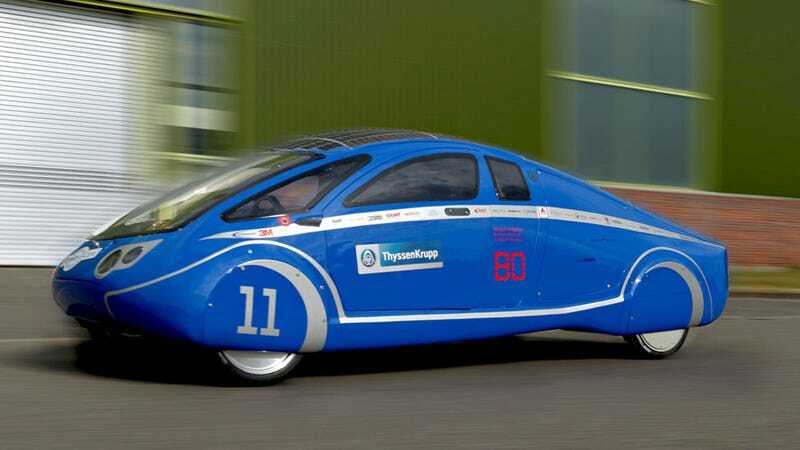 Most solar cars have very low HP engines (think 2 or 3) but are so light and aerodynamic that they can reach 100 MPH, go 250 miles on a battery charge, or travel at 60 MPH just on direct solar energy alone. There's still a very long way to go before solar power is a viable way to power one's daily driver, but it's absolutely worth pursuing, as solar power is about as close to free energy as we're ever going to get. Fusion energy is, of course, the holy grail, but it's important to remember that there's a fusion reactor about 93 million miles away that's great for giving us rich, deep tans and provides about 100W of energy per square foot. Being able to harness that energy for driving would be incredible. For example, take the Cruiser-class car PowerCore Sun Cruiser, by ThyssenKrupp Steel and Bochum University — today it's in third. I think it looks pretty great, and even boasts a trunk. We'll see how this one does, but it should be fascinating regardless. For updates and race results, check here and remember, gamble responsibly.